City councilman Bobby Henon sits through a Philadelphia City Council meeting inside Council Chambers in Philadelphia on Thursday, Feb. 07, 2019. A week after pleading not guilty to federal corruption charges, City Councilman Bobby Henon returned to Council chambers Thursday, saying he won’t surrender his post as majority leader and plans to run for reelection this year as he defends himself in court. Henon discussed his political future but would not answer questions about any of the allegations in last week’s indictment. Federal prosecutors accused Henon of working as a puppet of labor leader John “Johnny Doc” Dougherty, misusing his Council seat. According to a 116-count indictment, Henon, at the direction of Dougherty, who was also charged in the indictment, used his position to get Comcast Corp. to award $2 million in contract work to an electric company owned by a friend, and to shut down a nonunion project at Children’s Hospital of Philadelphia, among other allegations. In addition to Henon and Dougherty, six other members and allies of Local 98 of the International Brotherhood of Electrical Workers were charged with fraud, bribery, embezzlement, or related counts..
Henon has held his $140,000-a-year Council job while being paid more than $73,000 annually by Local 98 for what federal officials described as a no-show job. Asked if he would give up the union post, Henon said he’s always disclosed his two jobs. “I have done nothing wrong and I will not speak to the indictment,” he said several times during a five-minute exchange. Another allegation in the indictment says that in July 2015, Henon, responding to Dougherty’s pique, took aim at the installation of two MRI machines at Children’s Hospital of Philadelphia because the work was being done by nonunion labor. After the councilman filed a complaint with the Department of Licenses and Inspections, inspectors issued a stop-work order. The department reversed the order but then issued another one after another Henon complaint. 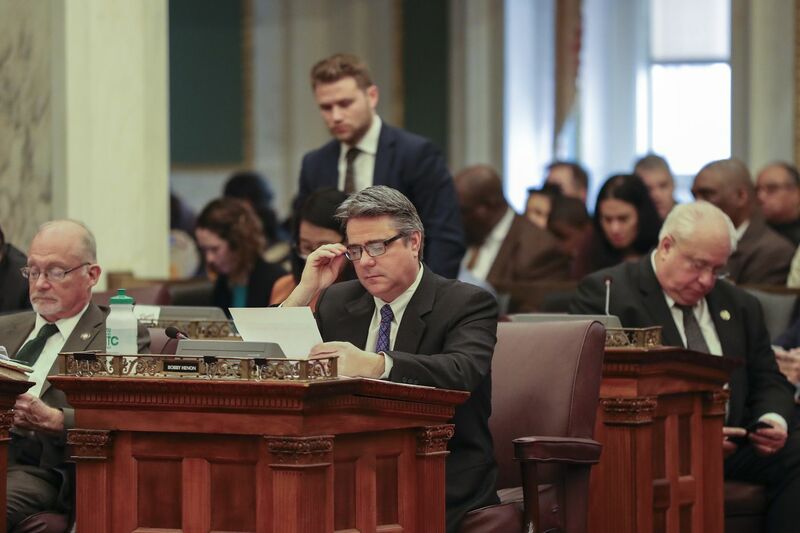 “My office, my staff, and myself speak with L&I on a regular basis during the course of doing my job that the citizens of Philadelphia elected me to do," Henon said Thursday in response to a chorus of reporters’ questions. Asked directly if he called L&I about the CHOP project, Henon declined to answer. Henon’s communications director interrupted, saying he needed to get to the Council meeting. Once there, Henon sat in his seat and began shuffling through papers. He introduced a resolution honoring the Chinese Lunar New Year and an ordinance regarding truck parking in his district. Henon said he will continue to work with his colleagues, vote on bills, and introduce legislation. "We’re going to continue to do that on a daily basis and look forward to doing it for the next year and the next four years,” he said.